I have bad time with yeast baking these days. The yeast I own is not at all proofing which disappoints me much when I crave and tempt to bake my favorite breads. 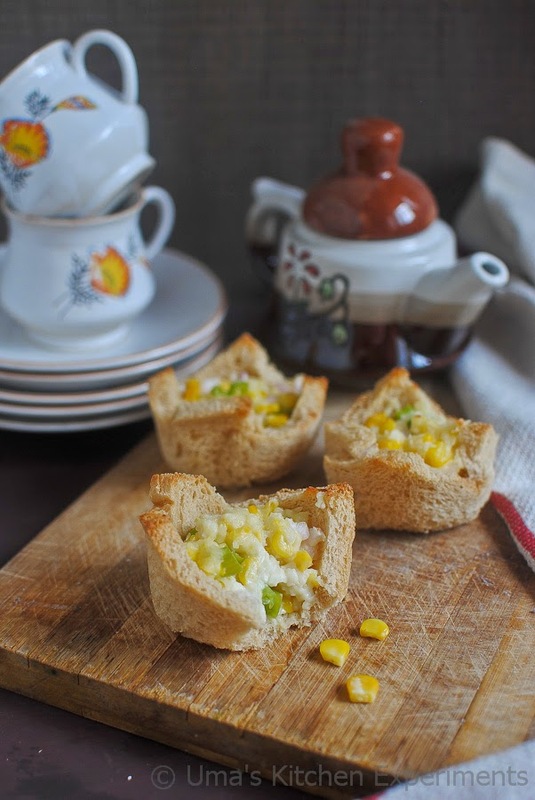 When IFBM 2014 announced it's baking challenge for Freedom Tree, I was pretty happy since I also have a thought of preparing a beautiful bread recipe that uses corn in it. Unfortunately, my yeast didn't prove and gave up the thought for participating in the contest. I rejuvenated myself after a nice sleep, decided to do some easy recipe using corn which doesn't use yeast in it. 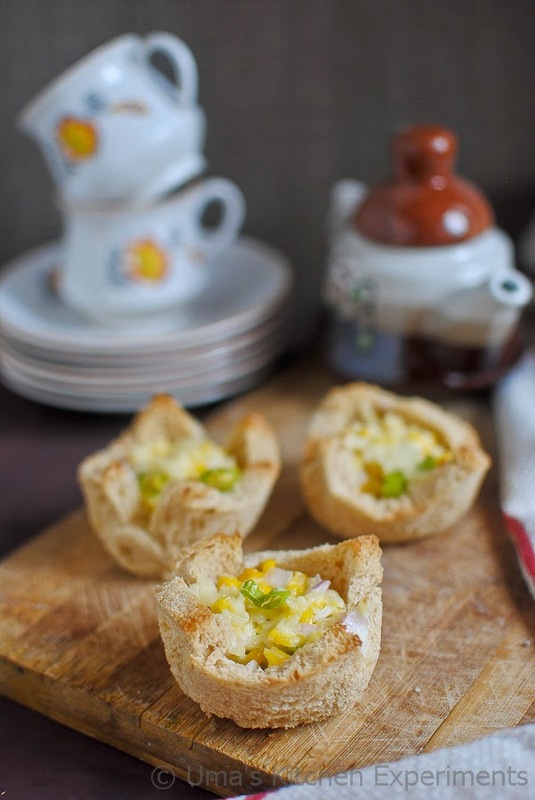 Bread cups came to my mind since I prepare it often with various filling. 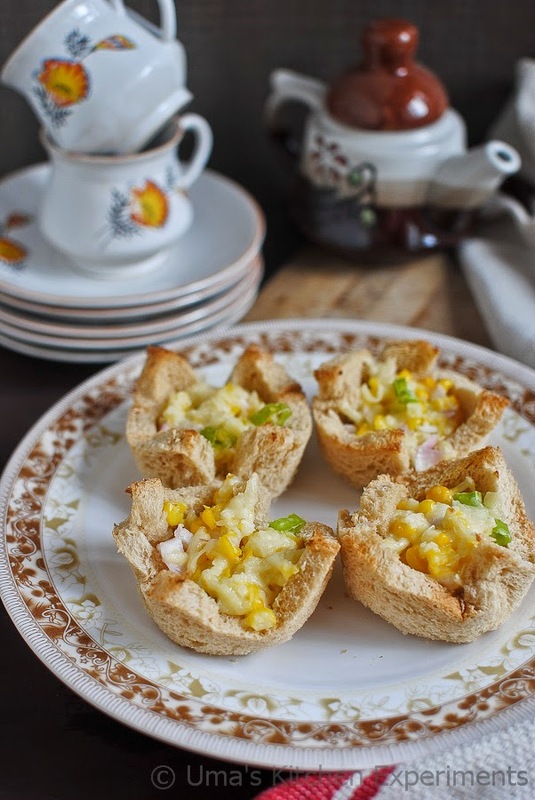 This time I used corn since it is the must ingredient for the contest. 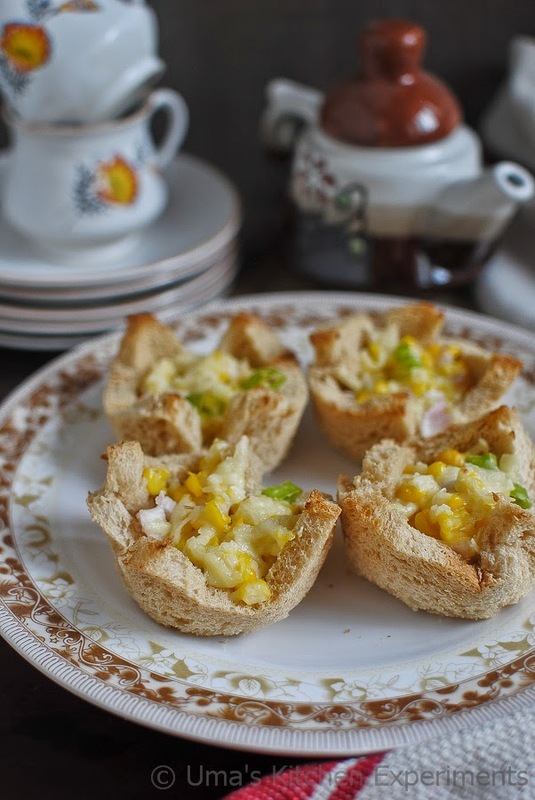 I started with these bread cups and ended up with three recipes all following one by one. This is first entry to the IFBM and Freedom Tree Baking Contest. 1) Preheat the oven to 200 C for 15 minutes. 2) In a mixing bowl, add corn, processed cheese, onion and green chilli and salt. Mix well. 3) Remove 4 brown corners of the bread slices. Carefully place it in the muffin tray to form the shape of cup. It may tend to break. Don't worry. It will set while baking. 4) Place 2-3 tablespoons of the prepared mixture to the bread cups. 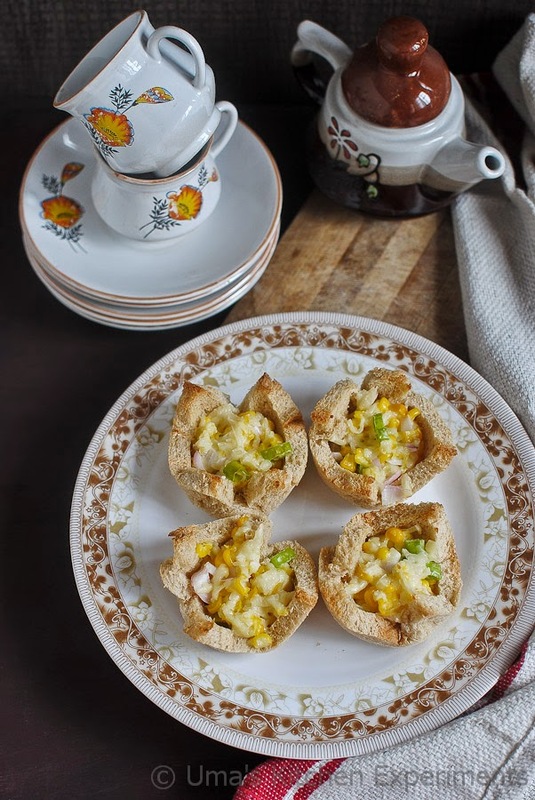 5) Keep inside the preheated oven for 10-15 minutes by reducing the temperature to 180C or till the bread cup becomes crisp and cheese melts well. 6) Cool down for couple of minutes and serve hot. 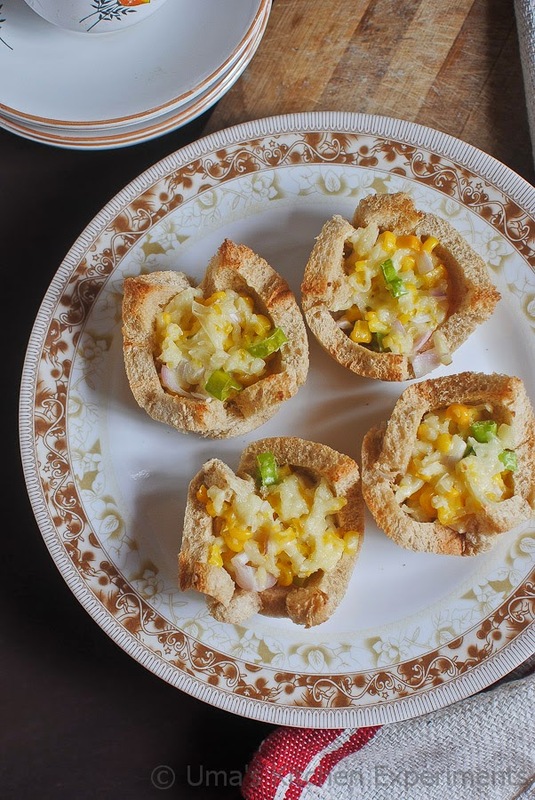 1) Instead of bread slices, you can also use puff pastry or filo pastry or tortilla sheets. 2) Make sure to transfer the bread cups to the wire rack immediately. 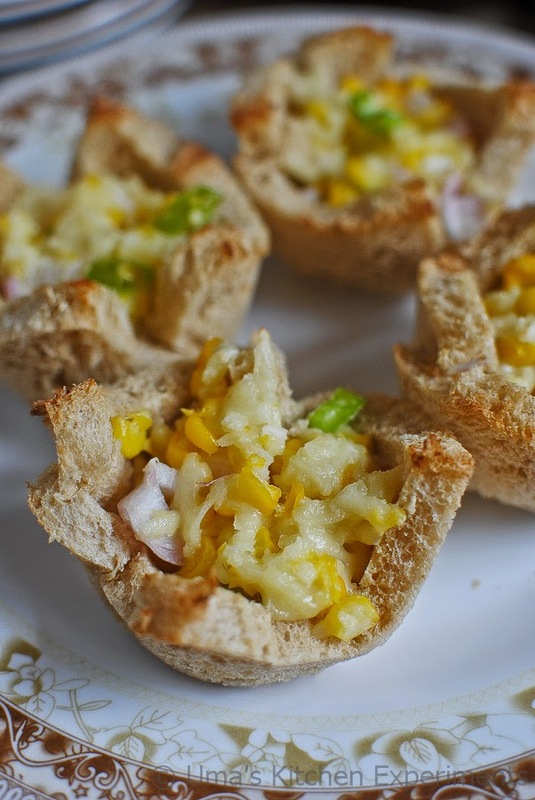 Otherwise,the bottom part of the bread cups become soggy. 3) Feel free to change the stuffing as per your personal preference.